I always get excited to draw an old family home. This one’s located on Savannah’s East Side. Mini-prints were made for the entire family and given as little gifts over the holidays. A nice way to remember your youth, no? Even though we moved a lot during my childhood, I still feel a connection to each of the places we occupied. Our time there may have been short-lived, but we worked hard to make each house a home. A few weeks ago, my brother took a trip to Richmond, VA, and snapped this pic of our old place. Oh the memories it uprooted! 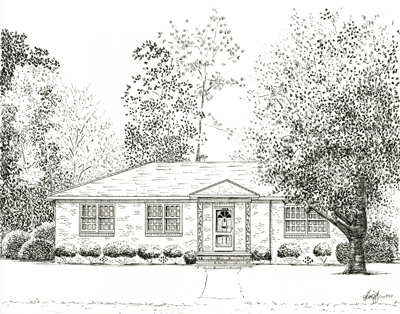 I’ve often pondered sketching all of our old homes (I’ve had several clients do this, and it makes for quite the collection), but finding all those old photos from the pre-digital camera days, would be quite the challenge. Jim Croce sang about it…and I suppose you could call me a memory hoarder. 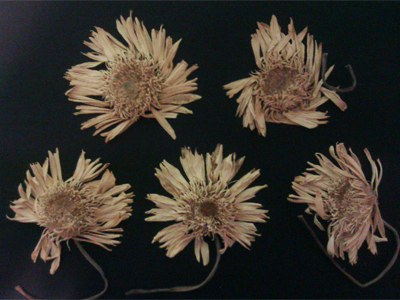 Suggestions for dried Gerber daisies? I’d be okay just salvaging one, but they’ve sat on my desk for nearly a year (362 days to be exact) with no real inspiration coming to mind. a little nostalgia for your Tuesday..
Bekah came across a card, addressed to me, from say 3 or 4 years ago. I remember Miss Joy quite well, and this just warms my heart! Little finds like this remind me of how much I enjoyed teaching art. I think we are all born with a full supply of creativity, that sadly, whittles away the older we get. Working with the little ones (white at times exhausting) proved a constant source of inspiration…maybe one day, I’ll sign up again.